We’ve all heard the horror stories about Japanese knotweed growing up through concrete and rendering our homes practically worthless, while earlier this year some questionable new research from the University of Leeds claimed that there is no evidence that knotweed damages property. So where does the truth lie? As usual, it’s somewhere in between. Japanese knotweed can’t grow through concrete, but it can certainly exploit weaknesses such as cracks in concrete, asphalt driveways and drains to appear where it’s not wanted. If you were to build over a knotweed infestation, it would be unlikely to force its way up through your foundations to emerge in your living room floor, but it would certainly grow horizontally beneath the house to emerge at the sides and be virtually impossible to remove. There’s a good reason why Japanese knotweed is described by the Environment Agency as the UK’s most invasive and destructive plant species and I’ve seen first hand plenty of evidence of the damage it can do to buildings if it is left untreated. So, if you discover knotweed growing on your property, what should you do? The temptation may be to attempt to treat it yourself, but it is virtually impossible to kill with over the counter weed killer and very difficult to dig out without specialist equipment as the roots, or rhizomes, can spread several metres beneath the ground and the plant can regrow from a piece as small as a fingernail accidentally left in the ground. The best option is to call in the professionals who will treat the knotweed, either immediately by extracting it from the ground, or over two to three years using herbicide, which is the least expensive option. The most important thing is to secure an insurance backed guarantee for the work, as without this document it will be virtually impossible for you to sell the property in the future. 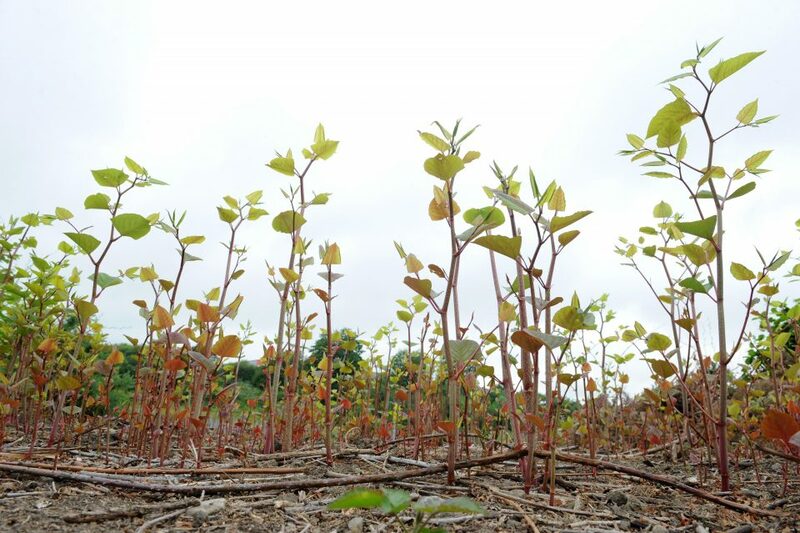 Another common myth about knotweed is that it’s illegal to have the plant growing on your land. It is not illegal and neither is Japanese knotweed a notifiable weed, so you don’t have to inform the authorities of its presence. However, if the knotweed spreads to an adjacent property you could face legal action from your neighbour and would most likely be forced to pay for the knotweed to be treated on both sides of the fence, as well as compensate them for any reduction in the value of the property and cover their legal costs! Similarly, if you sell a property that has been affected, even if it’s been successfully treated, you are obliged to inform any potential purchaser and could face legal action in the future if you fail to disclose that information. But with the right treatments and guarantees in place, there’s no reason why it should be a deal breaker. I recently published the UK’s first definitive guide to Japanese knotweed, to help people who are affected by the plant and to promote best practice in treating it successfully. My book, ‘Japanese Knotweed: Unearthing the Truth’ is available now on Amazon and in selected bookshops, priced at £14.99. Illustrated with colour photographs and beautiful hand-drawn sketches, I hope it is an invaluable aid for anyone concerned about Japanese knotweed and its rampage across the UK. Nic Seal is an environmental scientist, author and recognised expert in Japanese knotweed. He makes frequent media appearances on TV, radio and in national newspapers, and is regularly called upon to act as an expert witness in knotweed disputes and litigation.